There's No Such Thing As an "Apple Trap"
This morning's New York Times Magazine blows the lid off of an Apple conspiracy more outrageous than a dozen Foxconns. Cracking the Apple Trap, it's called in the print edition. Why Apple Wants to Bust Your iPhone, online. But in our hearts, let it be known only as Uhh... Seriously? Time to sigh together, point by point. 1. Apple may be coordinating the obsolescence of its products. 2. Which is annoying for consumers. 3. But possibly worse for the company. Got it? Good! Let's talk these out. Apple may be coordinating the obsolescence of its products. This sounds juicy, doesn't it? As economist and Cracking the Apple Trap writer Catherine Rampell sees it, her iPhone starts to slow down right about when a new model comes out. And planned obsolescence, as she points out, is a very real thing; you find it in industries as diverse as fashion and textbooks and, perhaps most popular among conspiracy theorists, lightbulbs. At first, I thought it was my imagination. Around the time the iPhone 5S and 5C were released, in September, I noticed that my sad old iPhone 4 was becoming a lot more sluggish. The battery was starting to run down much faster, too. And here we have perhaps identified the problem. The iPhone 4, much like Ke$ha's "Tik Tok," was released to the general public in the summer of 2010. It had 512MB of RAM, as little as 8GB of storage, ran iOS 4.0, and was graced with a 1,420 mAh battery. Three and a half years ago, that was very decent—though admittedly not flashy—hardware. In those last three and a half years, that phone has been through countless firmware updates, taken untold photos, been charged improperly (they all are), been dropped (likewise). It has, in short, been used. And the more the components within it are used, the more they will degrade. Even more importantly, the more advanced apps become, and the more they take advantage of new technological capabilities, the less mileage you'll get out of 512MB of RAM and 8GB of storage. The more times you charge your phone, the less likely it is to make it through the day. The more features Apple packs into iOS, the more it's going to drag down your system. These are technological truths that affect every single smartphone maker. You think your iPhone 4 is slow? Try a Samsung Fascinate. Batteries degrade over time. Software capabilities improve. Saying Apple plans the obsolescence of iPhones is like saying Dole plans the obsolescence of bananas. Which is annoying for consumers. Sure! It's annoying that your phone—or more specifically, your phone's battery, because that seems to be the crux of Rampell's argument—won't make it much longer than three, four years tops. It's also annoying that my car won't last 300,000 miles. It's annoying that my knees make a little popping sound when I stand up now. It's annoying that nothing lasts forever. 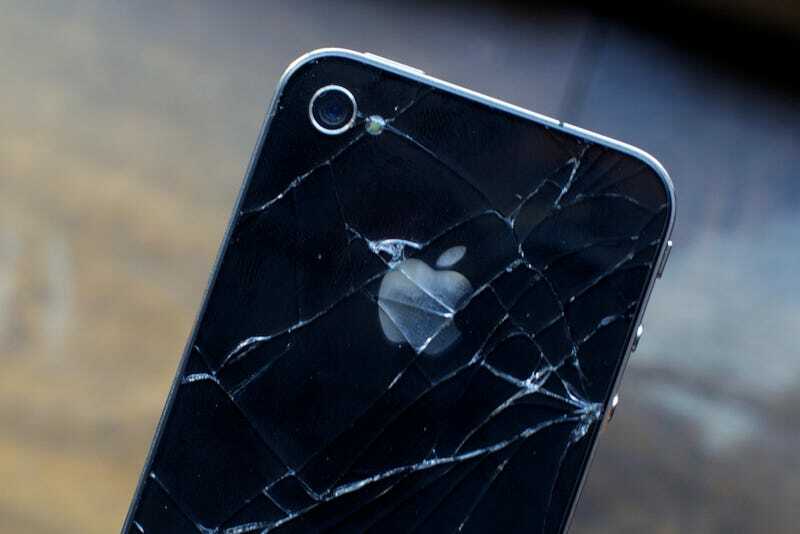 When Apple started making the iPhone in 2007, its product was so innovative that it could have deliberately degraded durability without fear. But in the last couple years, the company has faced stiffer competition from Samsung and HTC, among others, which should deincentivize planned obsolescence. This implies that a Samsung or HTC phone will have more longevity than an iPhone. That all it takes is one smartphone maker who's bold enough to make a device that lasts forever. Surprise! There's no such thing. Rampell makes one more relevant point here; she could either replace her phone's battery for $80, or get a new iPhone 5C phone for $100. I would offer a modest correction. She could have gotten a 5C for as little as $45 had she kept an eye out, or an iPhone 4S for free. Either way, it's not a particular burden. Getting a new phone (for free, on contract) every two or three years is annoying, sure. But it's annoying in the way that hangnails are annoying, or forgetting to set the DVR. What it's decidedly not is a trap. But possibly worse for the company. There are two ways to avoid the kind of obsolescence Rampell talks about here. Neither of them is pretty. The first method is to future-proof your smartphone, pumping it so full of guts that it'll be ready for whatever comes next. Motorola tried this when it gave the Droid MAXX a 3,300 mAh superbattery. But the Droid MAXX also costs 50% more on-contract than the iPhone, and that's with lesser specs in nearly every other regard. This kind of future-proof iPhone would be terrible for Apple; it would send the price of an already premium product into the stratosphere, with little to no immediate (or even near-term) benefit to its customers. It would be like putting rocket engines on a car that can only go 60 miles per hour. The other option would be not to innovate on the software side. At all. Just freeze iOS in time, freeze the million apps in the App Store. No new RAM-intensive features, no better camera that takes larger file-size pictures, no new game levels that take up valuable storage space. Your phone would work much better, sure. But after a year, no one would buy it, because everyone else, in the meantime, would do the one thing technology is supposed to do: innovate. Oh, also, your battery would die anyway. I don't doubt that Rampell is coming from a place of genuine frustration. But it's misinformed, and worse, misleading. Technology becomes obsolete. Batteries don't last forever. That's not exclusively Apple's problem, nor is it exclusively Apple's fault. And the only thing busting your phone is the same thing that's busting you and everything else: time. This post originally appeared on Tuesday, 10/29.